The mangonada reigns supreme at Chicago’s many neverias. 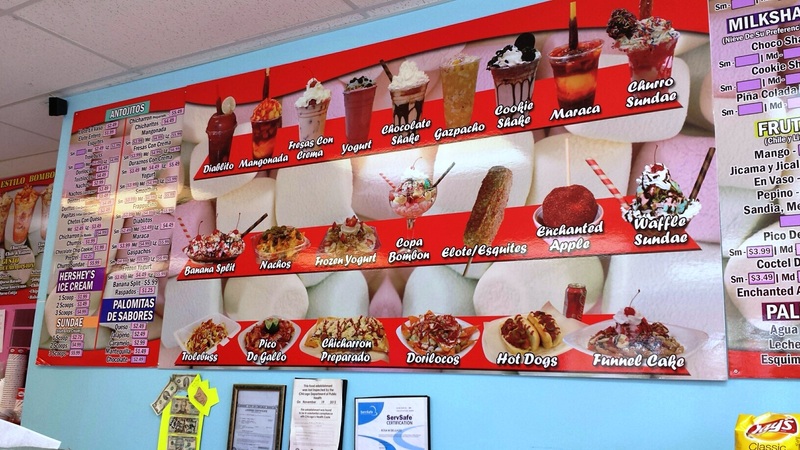 These Mexican ice cream shops have grown exponentially in the Chicago area in recent years. While some Chicago foodies are still swooning over doughnuts, cronuts or wonuts, others have moved on to the sweet treat taking over Chicago’s Mexican ice cream shops. It’s called the mangonada, and if you haven’t tried it yet, here’s what to expect: cool mango sorbet topped with fresh mango chunks and a sweet salty sauce called chamoy. The dessert takes center stage at Chicago’s neverias, Mexican ice cream shops whose numbers have ballooned over the last two years. Eladio Montoya opened his first Los Mangos Neveria in 2012, but today he’s expanded to seven thriving stores in the Chicago area. Indeed, there are now more than 60 neverias operating in Chicago’s city limits and likely just as many more serving nearby suburbs like Aurora, Rolling Meadows, Maywood, Berwyn and Cicero. MAP: Where are Chicago&apos;s neverias? Many used to operate as popsicle shops or paleterias. But in recent years they’ve expanded into full service snack shops serving sundaes, yogurt parfaits, fruit cups, corn in a cup, and smoothies. Then there are the Dorilocos, a family of snacks that some might recognize as the more colorful cousins of the walking taco. They start with a bag of chips that gets sliced down the side with scissors and then it&apos;s filled with cucumbers, pickled pig skin, crunchy peanuts, hot sauce and more. While most neverias offer similar menus, each tries to distinguish itself with signature hybrid dishes. At Los Mangos in Little Village one of those treats is the Honey Bun sundae--yes a honey bun at the bottom of an ice cream sundae. Cynthia Alvarado works at Bombon Neveria in Riis Park where they serve a hybrid snack called Elotes Bombon Style. It starts with a choice of Doritos, Fritos, Churritos or Tostitos. “They all come with corn [cut from the cob] and then you pick the flavor of the sauce you put on it,” she says. “Either chile limon, habanero, chipotle or jalapeno. It’s like a mayo sauce." The dish is finished with a topping of bacon or ham and voila! Amid all the corn chips and ice cream, neverias also sell a lot of fresh fruit--including papaya, mango, watermelon and pineapple. Still, he admits it’s the ice creams that draw the most customers this time of year. Among his dozens of flavors, you’ll find pine nut, mango with chile, egg nog, tequila, cheese, cucumber, bubble gum, guava and more. But Montoya says you need more than great ice cream to succeed in this business. You also need funky names like the vampire or vampiro featuring mango ice cream and a blood red sauce or the bionico a bionic blend of cream, fruit, nuts and raisins. Arcoiris in Avondale on Belmont Avenue used to be a paleteria before it expanded like so many others. Today one of its most popular items is the green smoothie full of parsley, cactus, green apple, spinach, cucumber and more. So what does he recommend for first timers? The honey bun sundae, you might want to leave for your second trip. FOR FRUIT LOVERS: Get a coktel de fruta. A dish of freshly cut jicama, cucumber, papaya, pineapple, mango, pineapple or melon (depending on store) showered in lime juice, chile powder and salt. Tell the server which fruits and toppings you want. FOR HEALTH NUTS: Many neverias serve green drinks of spinach, cucumber, parsley, cactus, green apple, yogurt, oats, honey, kiwi and more. Exact ingredients will vary but I love the green blend from Paleteria Arco Iris at 2950 W. Belmont Ave.
FOR SPICY SNACK LOVERS: Get the Dori-, Taki- or Tostilocos and indicate which toppings you want. The pickled pig skin strips (cueritos) add a vinegary chew but they are not for everyone. The cabbage, cucumber and jicama make you feel almost virtuous while eating chips. The chicharron preparado is similar but uses fake pork rinds instead of chips. FOR THE INDULGENT: Try one of the churro, doughnut or honey bun sundaes. Perk it up with innovative ice cream flavors like cheese, cucumber or gooseberry. FOR TRADITIONALISTS: Get a strawberry popsicle (often studded with big chunks of strawberry) a scoop of ice cream, mangonada or fruit gazpacho if you don&apos;t mind salty cheese and chile in your orange juice. FOR THE MEAL SEEKERS: Many neverias serve sandwiches called tortas along with fresh fruit drinks called raspas or raspados. FOR ASBESTOS MOUTHS: Try a diablito (or little devil) which blends fruit, juice and LOTS of chile. Update: Thanks to Summer Paleta Crawl for letting us know about a few places missing from the original map.